Milledgeville. That's all you have to hear as a basketball team to know you have come very far. 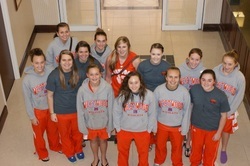 For the past two years, the Westwood Ladycats have reached their peak in performance setting a record at the school. The underdogs made their appearance at the state championship in Milledgeville in 2011. That year, the team set it as their highest goal to make it their again next year. We did. In 2012, we had to face off to our biggest rivalry for the state title again, the Crisp wildcats. So who's the real cat? Us. The Ladycats realized even if we didn't have the best player in the state, we had the best team. Each time we played, we drew a bigger crowd than before. The atmosphere was great, and it made us hungry, hungry to be in that gym again. Both state championships, we came up short. While we were on this amazing journey, we grew close as a team. Each battle made us stronger as a team. After that final buzzer sounded, it only made us more hungry to be in Milledgeville again next year. With our team, we can do anything. All for one and one for all. United we stand, divided we fall. Go Ladycats!